Mahāyāna (literally «great vehicle»; from the Indian language of Sanskrit. Chinese: 大乘, Dàshèng; Japanese: 大乗, Daijō; Vietnamese: Đại Thừa; Korean:대승, Dae-seung) is one of the major branches of Buddhism. (See Yana for the classification of Buddhism into vehicles, and Schools of Buddhism for further information.) Mahayana originated in the Indian subcontinent, and some of the areas in which it is practiced today are India, China, Tibet, Japan, Korea, Vietnam, and Taiwan. From Mahayana developed the esoteric Vajrayana which claims to encompass all previous schools. Universalism, Everyone will become a Buddha. Enlightened wisdom, as the main focus of realization. Compassion through the transferal of merit. Salvation— as opposed to Liberation— supported by a rich cosmography, including celestial realms and powers, with a spectrum of Bodhisattvas, both human and seemingly godlike, who can assist followers. “Philosophical Mahayana” tends to focus on the first three characteristics (Universality, enlightened wisdom, compassion) without showing much interest for supernatural constructions, while “Devotional Mahayana” mainly focuses on salvation towards other-worldly realms. Mahayana traditions generally consider that Sravaka-Buddhahood is not final. This is based on a subtle doctrinal distinction between the Mahayana and Nikaya traditions concerning the issues of Nirvana-with-remainder and Nirvana-without-remainder. The traditions considered that Nirvana-without-remainder always follows Nirvana-with-remainder (Buddhas first achieve enlightenment and then mahaparinirvana at ‘death’) and that Nirvana-without-remainder is final;Whereas the Mahayana traditions consider that Nirvana-without-remainder is always followed by Nirvana-with-remainder – the state of Sravaka-Buddhahood is not final, and is eventually succeeded by the state of Samyaksam-Buddhahood, or total enlightenment. This distinction is most evident regarding doctrinal concerns about the capability of a Buddha after mahaparinirvana (which is identified by the Nikaya as being nirvana-without-remainder). Most importantly, within the Nikaya, a Samyaksam-Buddha is not able to directly point the way to nirvana after death. This is a major distinction between Nikaya and the Mahayana, who conversely state that once a SamyaksamBuddha arises, he or she continues to directly and actively point the way to nirvana until there are no beings left in samsara. Because the views of Nikaya and Mahayana differ in this respect, this is exactly why the Mahayana do not talk about a bodhisattva postponing nirvana, and exactly why the Nikaya do. For example, within Nikaya traditions, Maitreya has chosen to postpone his Nirvana in order to introduce the Dharma when it no longer exists. While within Mahayana schools, Maitreya will also be the next Buddha manifest in this world and introduce the Dharma when it no longer exists; however he is not postponing his Nirvana to do so, and when he dies (or enters mahaparinirvana), he will likewise continue to teach the Dharma for all time. Moreover, Mahayana argues that although it is true that for this world-system Maitreya is the next Buddha to manifest, there are an infinite number of world-systems many of which have currently active Buddhas or Buddhas-to-be manifesting. So based on the Nikaya/Mahayana doctrinal distinction of the meaning of nirvana-without-remainder, we see two distinct views concerning the path of the bodhisattva, with the Nikaya stating that Bodhisattvas postpone their own Nirvana, whereas the Mahayana schools stating that Bodhisattvas attempt to reach Nirvana as soon as possible, just like Nikaya Sravakas do, but with the motive to continue to effortlessly benefit all beings for all time due to the distinction of views regarding the ability of a Buddha after mahaparinirvana. 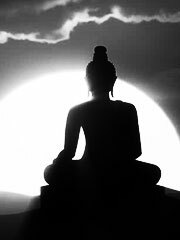 Because the Mahayana traditions assert that eventually everyone will achieve Samyaksam-Buddhahood or total enlightenment, the Mahayana is labelled universalist, whereas because the Nikaya traditions assert that there are three routes to Nirvana, which are distinct, they are considered not to be universalist. According to Mahayana, traditional Buddhism tends to focus on an ascetic, individual, approach to attain Nirvana: suppression of desire, removal from the world, solitariness. Its followers are śrāvakas and pratyekabuddhas. On the contrary, the primary focus of Mahayana is bodhicitta: a mind of great compassion conjoined with wisdom (prajna) realizing emptiness. With this mind the practitioner will realize the final goal of full enlightenment, or Buddhahood: an omniscient mind completely free from suffering and its causes, that is able to work tirelessly for the benefit of all living beings, becoming a Bodhisattva. Six virtues or perfections (paramitas) are listed for the Bodhisattva: generosity, patience, meditation, morality, energy and wisdom. Many “philosophical” schools of Mahayana Buddhism have focused on the nature of enlightenment and Nirvana itself, from the Madhyamika to the Yogacara and culminating with Zen. Compassion, or Karuna, is the other key concept of Mahayana, and considered the indispensable complement to enlightened wisdom. Compassion is important in all schools of Buddhism, but particularly emphasized in Mahayana. It relies on the idea that excess acquired merit can be transmitted to others.The Bodhisattvas are the main actors of compassion, Avalokitesvara being foremost among them. Although having reached enlightenment, Bodhisattvas usually make a vow to postpone entering into Nirvana until all other beings have also been saved. They then devote themselves to helping others reach enlightenment. “Devotional Mahayana” developed a rich cosmography, with various supernatural Buddhas and Bodhisattvas, residing in paradisiacal realms. The concept of Trinity, or trikaya, supports these constructions, making the Buddha himself into a transcendental god-like figure. Under various conditions, these lands could be attained by devotees after their death so that when reborn they could endeavour towards Buddhahood in the best possible conditions. Depending on the sect, this salvation to “paradise” can be obtained by faith, imaging, or sometimes even by the simple invocation of the Buddha’s name. This approach to salvation is at the origin of the mass appeal of devotional Buddhism, especially represented by the Pure Land. This rich cosmography also allowed Mahayana to be quite syncretic and accommodating of other faiths or deities. Various origins have also been suggested to explain its emergence, such as “popular Hindu devotional cults (bhakti), and Persian and Greco-Roman theologies, which filtered into India from the northwest” (Tom Lowenstein, “The vision of the Buddha”). The Mahayana scriptures were probably set in writing around the 1st century BCE. Some of them, such as the Perfection of Wisdom sutras, are presented as actual sermons of the Buddha that had been hidden. By some accounts, these sermons were passed on by the oral tradition as with other sutras, but other accounts state that they were hidden and then revealed several centuries later by some mythological route. In addition to sutras, some Mahayana texts are essentially commentaries. Among the earliest major Mahayana scriptures that are attested to historically are the Perfection of Wisdom (Prajna-Paramita) Sutras, the Avatamsaka Sutra, the Lotus Sutra, the Vimalakīrti Sutra, and the Nirvana Sutra. Mahayana Buddhist sometimes divide Shakyamuni Buddha’s exoteric teachings into three general categories, known as «turnings of the wheel of dharma»: the Hinayana, the Prajna Paramita, and the Tathagatagarbha teachings, respectively. The Mahayana canon further expanded after Buddhism was transmitted to other countries such as China and Tibet, where the existing texts were translated. New texts, such as the Platform Sutra and the Sutra of Perfect Enlightenment were explicitly not of Indian origin, but were widely accepted as valid scriptures on their own merits. Other later writings included the Linji Lu, a commentary by Chan master Linji. In the course of the development of Korean Buddhism and Japanese Buddhism, further important commentaries were composed. These included, for example, in Korea, some of the writings of Jinul, and in Japan, works such as Dogen‘s Shobogenzo. Scholars believe that Mahayana as a distinct movement began around the 1st century BCE in the North-western Indian subcontinent (in what is now the country of Pakistan) estimating a formative period of about three centuries before it was transmitted in a highly evolved form to China in the 2nd century CE. According to Williams (1989), the development of the Mahayana was a slow, gradual process. The Mahayana was not a rival school, and therefore it was not the consequence of a schism (sanghbheda). Mahayana and non-Mahayana monks could live without discord in the same monastery, so long as they held the same code. «Made in the year 28 of the reign of king Huvishka, .. for the Buddha Amitabha« (Mathura Museum). Such inscriptions in Indian proper (Mathura) are rather late and few (the next known one is dated to the end of the 3rd century), in comparison to the multiplicity of Mahayana writings transiting from Central Asia to China at that time, and the involvement of Central Asian Buddhist monks, suggesting the focus of Mahayana development was probably in the northwest. The first known Mahayana texts are translations made into Chinese by the Kushan monk Lokaksema in the Chinese capital of Luoyang, between 178 and 189 CE. Lokaksema’s work includes the translation of the Pratyutpanna Sutra, containing the first known mentions of the Buddha Amitabha and his Pure Land, said to be at the origin of Pure Land practice in China, and the first known translations of the Prajñāpāramitā Sūtra, a founding text of Mahayana Buddhism. The formal rise of Mahayana Buddhism has been dated to around the middle of the 2nd century CE, when the Kushan emperor Kanishka convened the 4th Buddhist Council in Gandhara, which confirmed the formal scission of Mahayana Buddhism from the traditional Nikaya schools of Buddhism. This was also the time and place of a rich cultural interaction between Buddhism and Hellenistic culture, which influenced the early representations of Buddhas, in what is known as Greco-Buddhist art. From the 1st century CE and in the space of a few centuries, Mahayana was to flourish and spread in the East from India to South-East Asia, and towards the north to Central Asia, China, Korea, and Japan, culminating with the introduction of Buddhism in Japan in 538 CE. Mahayana disappeared from India during the 11th century, and consequently lost its influence in South-East Asia where it was replaced by Theravada Buddhism from Sri Lanka. Mahayana remains however the most followeed of the Buddhist doctrines to this day in Eastern Asia and the world.